The cutting-edge biocompatible near-infrared 3D tracking system used to guide the suturing in the first smart tissue autonomous robot (STAR) surgery has the potential to improve manual and robot-assisted surgery and interventions through unobstructed 3D visibility and enhanced accuracy, according to a study published in the March 2017 issue of IEEE Transactions on Biomedical Engineering. The study successfully demonstrates feasibility in live subjects (in-vivo) and demonstrates 3D tracking of tissue and surgical tools with millimeter accuracy in ex-vivo tests. More accurate and consistent suturing helps reduce leakage, which can improve surgical outcomes. Authored by the development team from Sheikh Zayed Institute for Pediatric Surgical Innovation at Children's National Health System and funded by the National Institutes of Health, the study explains the design of the 3D tracking system with near-infrared fluorescent (NIRF) markers and, using robotic experiments, compares its tracking accuracies against standard optical tracking methods. At speeds of 1 mm/second, the team observed tracking accuracies of 1.61 mm that degraded only to 1.71 mm when the markers were covered in blood and tissue. "A fundamental challenge in soft-tissue surgery is that target tissue moves and deforms, becomes occluded by blood or other tissue, which makes it difficult to differentiate from surrounding tissue," says Axel Krieger, Ph.D., senior author on the study and program lead for Smart Tools at the Sheikh Zayed Institute. 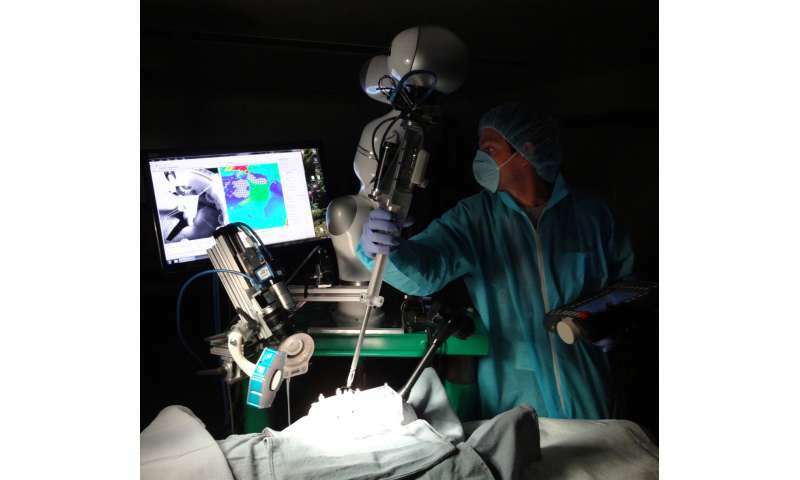 "By enabling accurate tracking of tools and tissue in the surgical environment, this innovative work has the potential to improve many applications for manual and robot-assisted surgery." The system is made up of small biocompatible NIRF markers with a novel fused plenoptic and near-infrared (NIR) camera tracking system, enabling 3D tracking that can overcome blood and tissue occlusion in an uncontrolled, rapidly changing surgical environment. Krieger explains that the NIR imaging has the potential to overcome occlusion problems because NIR light penetrates deeper than visual light. "This work describes the 'super human eyes' and a bit of 'intelligence' of our STAR robotic system, making tasks such as soft tissue surgery on live subjects possible," explains Peter C. Kim, M.D., vice president and associate surgeon in chief of the Sheikh Zayed Institute. Future work will include further integration and evaluation of the tracking system in image-guided medical interventions such as robotic surgeries.